One of the Park's most picturesque landscapes, the reservoir is 40 feet deep and holds a billion gallons of water. It was built in the 1860s as a temporary water supply for New York City, while the Croton Water system was shut down for repairs two weeks each year. At the time, it was unthinkable that a billion gallons of water would last less than two weeks. Today, some speculate that the City would go through that supply in just four hours. The reservoir was decommissioned in 1993, deemed obsolete because of the Third Water Tunnel. 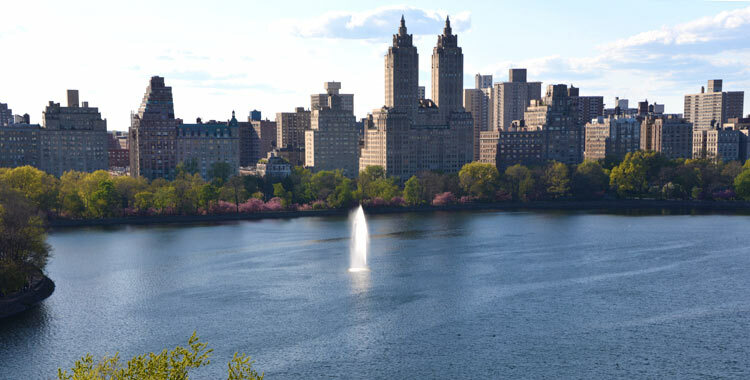 President Bill Clinton, Madonna, and Jackie Kennedy Onassis (for whom the reservoir was named in 1994) have all run on the 1.58-mile track. For years, an unsightly seven-foot-high chain-link fence obscured the view. But when scuba divers discovered a piece of the original fence at the bottom of the reservoir, Central Park Conservancy commissioned a steel fence with cast-iron ornamentation, closely resembling the original. The current fence was completed in 2003, stands four feet high, and has opened up breathtaking views of the Park and surrounding cityscapes. 85th Street to 96th Street, from east to west.